Bitter recriminations in the defeated US Ryder Cup camp erupted into another row on Wednesday as a non-playing member of the team launched a foul-mouthed tirade about Patrick Reed. An anonymous team member was reported as saying Reed "begged to play with Tiger" and is "full of s***" after the outspoken player claimed he was "blindsided" by beleaguered captain Jim Furyk. The angry exchange reported by USA Today came amid claims the alleged spat between Dustin Johnson and Brooks Koepka stemmed back to the US team's flight to Paris last week. Golf Digest and French sports newspaper L'Equipe reported that the pair had an argument over Johnson's fiancee, Paulina Gretzky. Koepka has denied the rift, despite multiple eyewitnesses saying he and Koepka had to be separated during a flare-up after the team's 17½-10½ humiliation at Le Golf National. Reed, meanwhile, had been openly fuming at Furyk for playing him only in the fourballs, meaning he sat out two foursomes sessions. 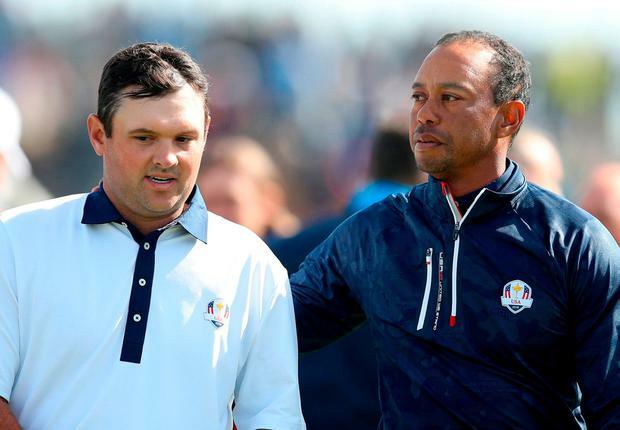 "For somebody as successful in the Ryder Cup as I am, I don't think it's smart to sit me twice," said Reed, who lost both fourballs matches alongside Woods before beating Tyrrell Hatton in the singles. But on Wednesday the unnamed team member said: "He would have shot 83 on his own ball Saturday... He totally screwed Tiger. He has no clue how to play team golf." Furyk's call to break up a partnership that had yielded four wins from seven matches in previous Ryder Cups was partly vindicated by Spieth's successful partnership with Justin Thomas, with the good friends winning three out of their four matches together. Koepka said that he was "all messed up inside" after causing spectator Corine Remande to lose sight in her right eye after a wayward tee shot on Friday. He said injuring 49-year-old Remande will rank as one of the worst days of his career. The woman from Egypt was watching the action at Le Golf National near Paris when his wayward drive at the par-4 sixth hole struck her in the face. Remande said that the force of the impact caused a fracture of her right eye socket and "explosion of the eyeball," prompting doctors to tell her she likely wouldn't see again. "It's a tragic accident, I'm heartbroken," Koepka told reporters at the Alfred Dunhill Links Championship at St Andrews. "It will definitely be the one shot I regret in my career. (The day he found out) was one of the worst days of my life. "I'm torn up about it. She's not going to be able to see out of her eye again and I hit the golf ball. It's upsetting." When asked about his alleged spat with Johnson, Koepka said: "'We've never fought, that’s not our relationship. We’re two even-keeled guys and I can't even remember raising my voice to him or him to me in our four years of friendship. That’s not who we are. "